Forget about crossing off only some of the items on your wish list for a new car. With an industry-defining meld of muscular styling, invigorating performance, roominess, and premier technology, the latest G80 for purchase or lease at Advantage Hyundai contains everything you want in a mid-size sedan (predicted to retain class-leading residual value). Genesis was able to achieve such a remarkable goal by building every facet around putting your automotive desires and needs above anything else. If this sounds like the type of vehicle you have been dreaming of for quite some time, take a few minutes to learn all about how it exceeds fulfilling your requirements and provides luxury road travel. Grabbing attention on the streets of Long Island, NY is something you will quickly become accustomed to when cruising in your athletically designed G80. A wide, assertive composition expresses your confident arrival, and the signature hexagonal crest grille highlights the dramatic front fascia that undeniably leaves a lasting impression on anyone you come across. Dynamic contours also make the vehicle appear in motion while stationary, creating a profound design statement for the rest to attempt mimicking. Plus, an available power tilt-and-slide sunroof gives you the chance to take in beautiful panoramic views and feel the rejuvenating effect of fresh air flowing through the open cabin. Precise control and smooth shifting are the essential traits of G80’s standard eight-speed SHIFTRONIC automatic transmission integrating steering-wheel-mounted paddle shifters and rev matching for all shift points. In addition, Intelligent Drive Mode lets you select preferred settings by simply pushing a button. Whatever the environmental circumstances or weather situations you find yourself in along your travels, grip is no longer a concern. The advanced dual-mode AWD senses traction loss and immediately transfers torque to certain wheels for optimum stability at times you need it the most. Responsive handling receives an extra boost thanks to a special kind of extremely strong and lightweight steel used to construct the firm central structure that supports and tunes operating dynamics. 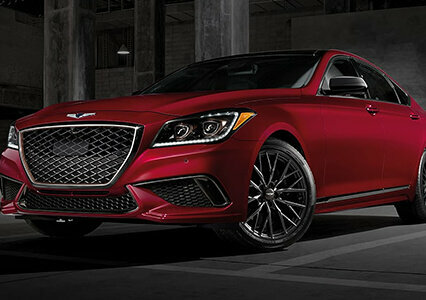 As an added bonus, the G80 Sport CDC suspension increases the level of agility for greater control. Performance fanatics on Long Island can still further amp up the look and feel of this distinctive sedan through the 3.8 Sport Package. On top of upgrading to a sport steering wheel, alloy pedals, and 19-inch (in.) sport alloy wheels, enhancements that create a more aggressive exterior include stunning dark chrome accents, dual exhaust tips, and dual sport front and rear bumpers. Believes us — you will not go unnoticed with these indications of a daring attitude. Purchasing or leasing the newest Genesis G80 opens the door to ample room for sitting back and stretching your legs in a surprisingly quiet, elegant atmosphere. The exquisite cabin surrounds everyone in unmatched comfort and lushness with optional soft Nappa leather featuring contrast stitching, heated and cooled seats in both rows, dual-mode ventilation incorporating a CO2 Sensor System for cleaner air, and embellishments like authentic matte-finish wood and aluminum trim. Your everyday rides and longer trips are also more enjoyable courtesy of an available Lexicon premium audio system with Clari-Fi technology and hands-free smart trunk that automatically lifts after three seconds of standing next to it with the smart key on you. Staying connected to the outside world and knowing the correct route to take are integral parts of sitting in the comfortable driver’s seat of G80. An optional Heads-Up Display projects important figures directly on the windshield to keep eyes looking forward. Included navigation on the offered 9.2-in. high-definition touchscreen ensures you are headed in the right direction, and split-screen view enables you to bring up other vital information at the same time. Connectivity is always established with Apple CarPlay and Android Auto compatibility. Also, add on the available wireless charging pad to reach full power without annoying cords. As you can certainly tell by now, the redesigned Genesis G80 made sure you did not have to sacrifice on any aspect, from refined power and intuitive controls to abundant interior space and forward-thinking safety measures. Excited to purchase or lease this class trailblazer? 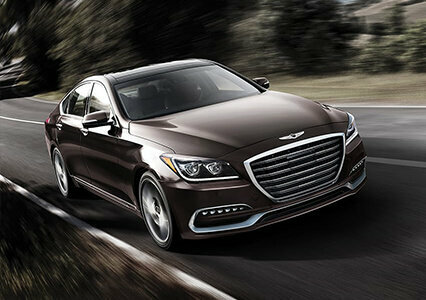 Then visit Advantage Hyundai today to put your name on the G80 that will bring back the joy of driving on Long Island and furnish you with all of the elements needed for superb rides.